Sometimes it seems there are more social network managers than social networks to manage. With big names such as HootSuite, Nimble, and Sprout Social, just to name a few, the field is getting crowded. Symphony brings better picture handling to the table. And that’s about it. Symphony is a social media manager for Facebook, Twitter and LinkedIn that focuses on image updates. All the usual features you’d expect to find are here: a post scheduler, a unified inbox, a social feed reader, and even auto-posting from blogs. Everything it does, Symphony does rather standard-issue. This changes when it comes to images. We all know the importance of visuals in social media feeds, and Symphony makes it very easy to create image updates. The Crosspost tool—where you compose updates—lets you easily add images from your computer, Dropbox, or the Web. The built-in image search makes sure you only find public domain or creative commons images, and the built-in Aviary image editor lets you touch up any image to perfection. When posting links, Symphony can extract images from them with one click, creating image-oriented updates that jump out. The automatic link shortener wraps everything up in a neat package. Creating image-based updates has never been easier than with the Crosspost tool. Unfortunately, this is Symphony’s only real selling point. Symphony comes in three price plans, with the seven-day free trial showing only the cheapest of the three. To start using Symphony, you must log in with your Facebook account. Once you do, don’t try to add Facebook Pages you manage under different accounts. This creates a whole different user for you, and you cannot manage two Facebook accounts under one user. You can bypass this with team collaboration—but that option’s not available in Symphony’s cheapest $14/month plan. 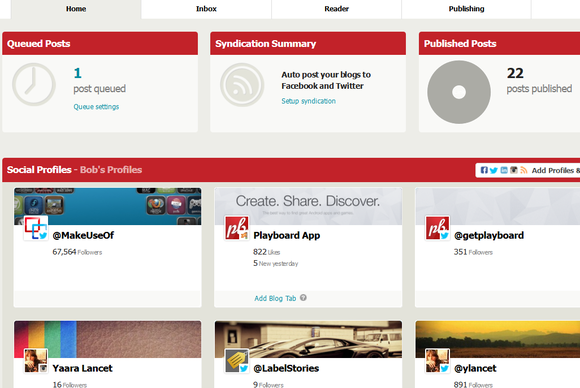 The Symphony homepage shows all your accounts and activities at a glance. If you own a blog, or love to share posts from others’ blogs, all plans include blog syndication. Add a blog to Symphony (must include RSS or Atom feed URL), and automatically send any new posts to any of your connected social accounts. These posts are also available to you when composing updates; click the RSS icon to choose a post from your blog to share, and make it pop by using Symphony’s image tools. Symphony’s more expensive plans also include a reader, where you can follow your social feeds and create custom feeds for keywords. You can also add your Instagram account to follow it from Symphony. 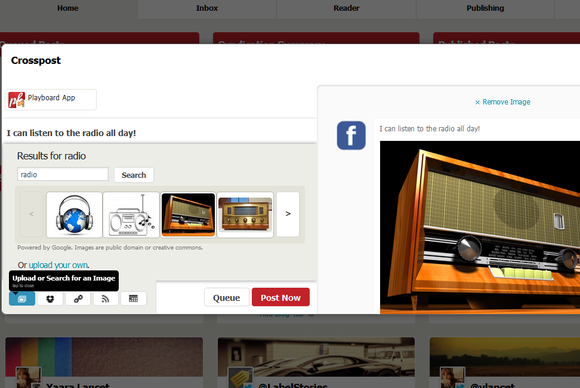 When you see an image or link you’d like to share on any network, drag and drop it into any of your other feeds. For example, if you see a photo on Instagram you’d like to share on Twitter, all you have to do is drag and drop. 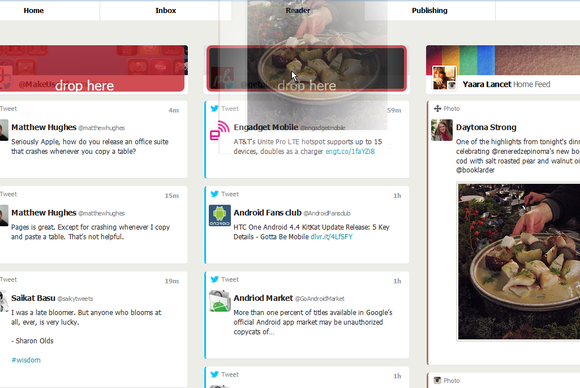 An adequate unified inbox lets you view your messages, wall posts, etc. under one roof. You can’t reply, retweet, or comment on these, but you can Crosspost them as your own updates. Dragging and dropping updates is a nice gimmick, but not something you’ll use all the time. Symphony brings some nice ideas to the table, and I would gladly use its image posting options in my job every day. The rest of the system, however, is just not good enough, especially when ones such as HootSuite are available for free. Symphony might not be the most expensive option out there, but it’s not the best one either. To be worth $14, $29, or $99 per month, Symphony needs to offer a better product, and not just a really cool feature wrapped in a less-than-ideal package. When that happens, it will definitely be worth the money. If all you care about is producing image updates easily, Symphony might be worth it.